One of the pleasures we enjoyed during our years in Palm Beach were our travels in our family yachts. Our family has a long history of power boating going back to the latter years of the nineteenth century. From South Florida our favourite destination were the Bahama Islands, at the time making their transition from a British colony to an independent nation. 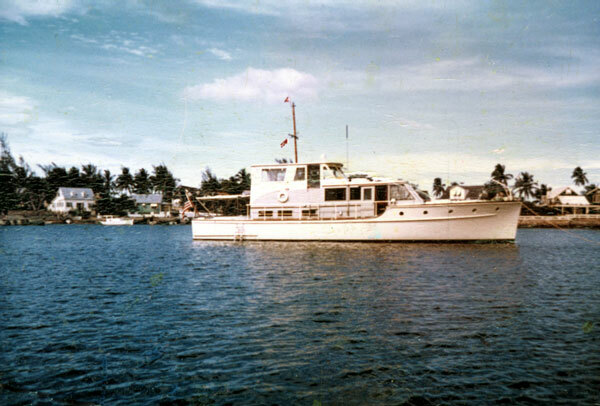 In 1965 (the same year Thunderball was made, also in the Bahamas) we cruised from Palm Beach Inlet to West End on Grand Bahama Island and then proceeded through the Abaco Islands, as you can see in the video below. We finally left the Abacos at the Hole in the Wall and proceeded south towards North Eleuthera Island and our destination, Spanish Wells. In reading the books on cruising the Bahamas and listening to my father, one theme emerged: the charts of the waters of the Bahamas were unreliable, both because the surveys weren’t very complete and because the coral reefs were complex with underwater rocks and outcroppings turning up in places you weren’t looking for them. In such instances it was recommended to seek a native guide to help guide one through the waters, someone who had lived there all his or her life, knew all of the underwater dangers and could guide one to safe harbour. Nevertheless, my father go the idea that he could pick his way through the reefs north of Spanish Wells. Late afternoon we came up on Big Egg Island and started our way through the shallow waters (it was nearly low tide when we did this) when we heard an uninspiring thud in the hull of the ship. We realized that we had hit a reef! My father and the crew scrambled down to the bilge to see if we were taking water on; they discovered that we weren’t, but that we’d better get to port and get some repairs done soon. So we radioed Spanish Wells and got a native guide out. He led us through the reefs and safely into the harbour. We spent the weekend there while the ship was being repaired, which was tricky because our yacht was nearly too big for the dry dock. We eventually got back to Florida from this adventure, but there’s more to this than just an error in navigation. Self-sufficiency in life is something many of us are raised to achieve. We feel compelled to be our own master and make our own way. We feel it beneath ourselves if we have to ask help for anything. But, like on the Bahamian reefs, we all eventually get to the point where the demands of life — and the consequences of our own mistakes — are just too much for us to handle. We can fake it for a while, but sooner or later things will catch up. Our boats, so to speak, will fill up with water and we will find ourselves at the bottom, never able to recover. It is in times like these that we need a native guide to help us along, to get us through the dangers and difficulties of life and bring us to safe harbour at the end. That native guide is Jesus Christ, who as God commands the spiritual realms and as man endured and ultimately triumphed over the difficulties of this life and ultimately death itself. He knows the way through the reefs and other dangers of life and can bring us to the safe harbour of eternal life with him at the end. If you realize that it’s time to stop hitting the reefs of life and get the native guide for eternity, click here. It’s a decision that you will never regret. Pingback: Positive Infinity » Blog Archive » An Episcopal Church Gets Its Roof Repaired. But Who Will Fix the Confirmation Class?